The wedding is a significant milestone for a couple. Especially for girls – they like to present themselves in the best light possible. So, choosing a wedding dress, searching through bridal updos, and picking the perfect shoes can be fun and stressful, at the same time. 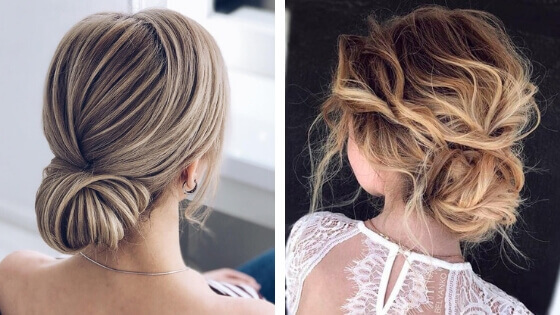 From braids to boho vibes – every updo counts. You can choose a perfect one, depending on your wedding dress and match it with your personal style. If you were wondering which one you should pick, don’t worry. We have prepared a dozen of updos to turn to for some inspo. Brown twisted low bun sound beautiful, and that is precisely how it looks. You can always add a shiny hair accessory to make this hairstyle interesting. It will also be a matching detail with your wedding dress. You can always count on braids for your wedding day. Combination of the low bun and a braid that goes across of your head is simply gorgeous. You can add a few interesting hairpins to make this hairstyle eye-catching. Platinum blonde dye will be an excellent choice for your wedding day. It is catchy, and it will look so highlighted when you gather it into an updo. For that glamorous retro vibe, do your bun at one side, instead of doing it low in the middle. Either way, you will look gorgeous – you can also add some cute pearl pin to hold and decorate everything together. Wavy hair that is gathered into a bun and a braid is a great bridal updo for your big day. You will need to have long hair for this hairstyle, but once you achieve it – you will adore it. Sometimes, brides like to go with something classy. No surprise there. A hairstyle like this will never go out of style, that is for sure! Make sure that this low bun match with your glamorous polished wedding dress. This particular bun looks so classy with a blonde hair like in the photo above. Needless to say that hair color most be taken into serious consideration before choosing your haircut. Read about best hair colors for fair skin or check various ash blonde hair color examples for some ideas. Instead of doing your hair into a bun, try doing it in a braid. It will look much more exciting and attractive. No additional details in your hair needed – this hairstyle is attractive enough itself. When you put on an accessory like this, it is hard to suppose that your hairstyle will be unnoticed. Lovely shiny hairpin will make any hairstyle look amazing, as it is the case with this braided bun. Instead of shiny accessories, you can also opt for a flower crown. Whether you pick fresh or fake flowers, no matter. They will both look fantastic on your bridal updo. The good thing about bridal updos is that you can choose the position of your buns and braids. Instead of doing it low, position your bun higher to the middle of your head. It will look equally chic and elegant as the low bun. Put pearls in your hair and don’t worry about the rest. Pearls are ultimately elegant detail not only in your hair but around your neck as well. Combination of pearls and bronze details will make you shine at your wedding day. Ballerinas wear this kind of buns, and that is how they got their name. The point with them is that they never go out of style. You can wear them with any dress. If you want to add a bit of glamorous vintage vibe to your hair, then opt for this updo. It is lovely for all the girls with medium and long hair. Don’t forget the shiny accessory – the crown plays the central role with this hairstyle. There is nothing that can beat fresh flowers in your hair. Even a classic updo like this will be super upgraded with a rose crown. Ponytails are utterly chic and stylish. That is why you should definitely opt for them at your wedding day. Add fresh flowers and make a hairstyle look a bit messy. If you are thinking about making a dramatic entrance at your wedding ceremony, this hairstyle is a great way to do it. A hair comb like this, with all these pretty pink flowers, will blow every guest away. If you have really long and thick hair braid it. Then make a hairstyle of that. Yes, it is that easy. Braided hair looks much more eye-catching than anything else.